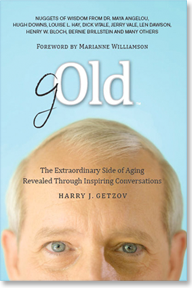 "Over the years, I have done my best to sift through the collected information, distilling it into more manageable excerpts—what I like to call special “nuggets” of wisdom and stories—which are now being presented to you in the form of gOld. The individuals you will be meeting in the coming pages [of gOld] are all remarkable, not because they are movie stars, legendary athletes or renowned leaders. They are remarkable simply because they have survived. They have persevered; and they are now in a position to share stories about their journeys and the insights collected along the way. Eldercation encourages us to face the good as well as the challenging side of aging. Old age, both others’ and our own, is not to be feared. It is to be nothing less than accepted and embraced. Old is, most certainly, not a four-letter word." “Don’t give up in pursuit of a dream. Life takes funny bounces, and you’ve got to be ready to catch the ball when it bounces your way. But you’ve got to keep after it. . . . .People might sometimes say, ‘Oh, well, you were lucky.’ Well, sure, luck played a great role in my professional career. But you have to have the ability to capitalize on the luck when it occurs; you’ve got to be there, you know? Somebody said—I forget who it was—that the most important part of success is showing up. I truly believe that’s so. "If my home had no mirrors . . ."